The Amzdeal Lightweight Metal Detector (with multi-function folding shovel) is certainly an interesting option for those just starting out. It peddles itself as being an entry level detector, ideal for treasure hunters who don’t have a lot of experience in this field. Now, Amzdeal is a bit of a jack of all trades when it comes to electronics, with its main focus not on metal detectors. Therefore, it was quite intriguing to see just what this metal detector had to offer. In terms of design and appearance, the Amzdeal lightweight metal detector is a lot like its counterpart, the Amzdeal Smart Hunter. The only real differences are the search coil and the control box. In this regard, the Lightweight detector is a great more simple than the Smart model. The three main components of this metal detector are the search coil, the shaft, and the control box. The top of the shaft does come equipped with an arm rest. The shaft is made of an alloy material and can be adjusted from a height of about 85cm to 115cm. The search coil is 18.5cm in diameter and is waterproof to a certain extent. It is important to note that the control box is not waterproof, nonetheless. For the Amzdeal lightweight metal detector to work, you are going to need a 9V alkaline battery. The company does not provide the battery when you purchase the detector. There is an earphone jack that will allow you to hear audible indications of the detectors discoveries. The earphones are not included in this kit. 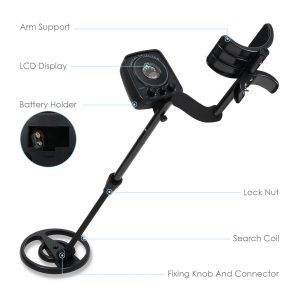 There is no doubt that the design of this Amzdeal metal detector is quite simplistic. However, this has been the intention of the company, to make it easy for anyone at all to use. It also has the added bonus of allowing you to use the metal detector almost immediately after you have received it. Along with the metal detector, you also get a user guide providing you with instructions and a multi-function folding shovel. The control box of the Amzdeal lightweight metal detector consists of an LCD display and three different knobs. There is also a small red light that indicates when the battery of the metal detector is getting low. The meter on the LCD display has a range between 0 and 10. In the event that the detector picks up something, the meter pointer will swing to the right. The three knobs are titled Volume, Sens, and Disc respectively. The knobs are quite basic and just involve turning the knobs to the right or the left in order to achieve your desired settings. The Sens knob can be used to increase or lower the sensitivity of the detector. There are no clear markings regarding the range of sensitivity. There are a few more indicators available with Disc although it is not marked out by numbers, merely dots of increasing size. 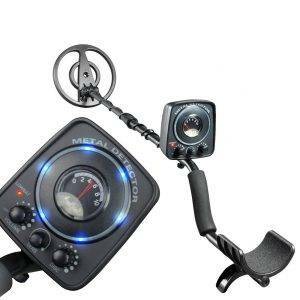 There are two modes offered with this Amzdeal metal detector – All Metal and Disc. As the name implies, All Metal allows you to search kinds of metals. This is done via auto ground balance and high sensitivity. The Disc mode allows you to discriminate between the types of metal that you are looking for. These are the only settings offered with the Amzdeal, making it easy to set up and use. There is very little expertise needed and the settings can be adjusted according to your preference with ease. To start off with, the Amzdeal lightweight metal detector has been specifically designed to be a great companion for beginner detectors. It is lightweight, making it comfortable to carry around and not get tired too quickly. As there are only a limited number of settings, you will not find yourself struggling for hours on end, trying to figure it all out. It is important to keep the simplicity in mind so that you can really keep the performance of the Amzdeal detector in context. It is a decently powered metal detector that will have you digging up coins, metal parts, nails, and even jewelry. As there is not a lot of adjustments to be made regarding discrimination, you can expect to pick up quite a lot of junk items. However, the sensitivity is quite good which does give you the opportunity to find a greater number of items. When the metal detector locates something, there are blue lights that light up around the LCD display. There is also a beeping noise that you can turn off or make louder, depending on your preference. You can also listen to the sound via headphones. The search coil is waterproof although you will be better off in as shallow water as possible. You will also find that it performs better in fresh water rather than sea water. As mentioned, this is the only part of the detector that is waterproof, so you should be careful. What I like about this metal detector is that it is actually a great option for kids. The shaft length is adjustable, making it great for little ones who are closer to the ground. It is also light enough for them to tote around. Last but not least it is just a matter of setting it up and letting them walk around with the detector. The shovel also comes in handy once you find something. If you are looking to give metal detecting a try, then this Amzdeal lightweight metal detector is one of the best detectors to get started with. It also makes for a great choice for children who want to take part in the activity. The price features offered, and the overall ease makes it a great entry level machine. 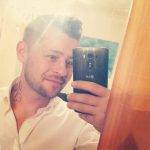 It will certainly have you hooked on metal detecting in no time at all. It offers great value for money and you are unlikely to be disappointed with your purchase.